This Video Shows People Trapped On Swinging Ski Lift In Rough Wind In Austria!!! A video showing terrified skiers stuck in a chairlift swinging violently from side to side has emerged as Storm Eleanor sweeps through Europe after battering Britain.The footage was shot at the Vorarlberg ski resort in Austria, where several people were left trapped in the lift system as the strong winds suddenly took hold. 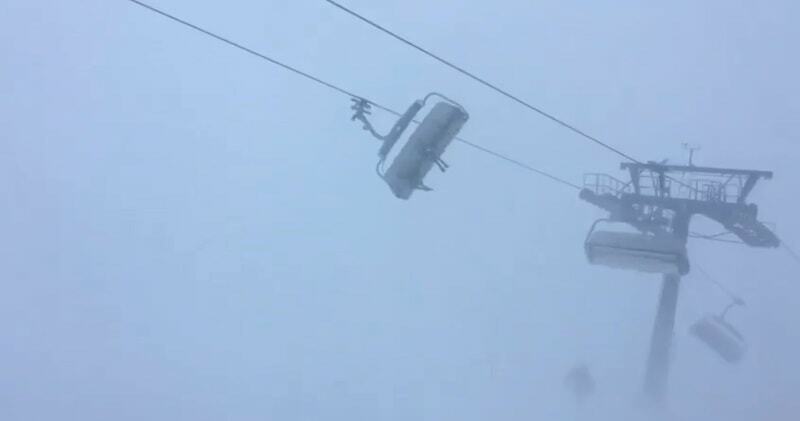 The winds seem to have been pretty steady, but the video below catches them when the chairlift is nearly being tipped over by the winds.Take these skiers yesterday at Silvretta Montafon in Austria who got more than they bargained for on this chairlift ride from hell. Certainly not the safest time to be on a chairlift, the post tells that many resorts in the Austrian Alps stopped running lifts because of the conditions. Hopefully those skiers didn’t eat lunch right before their runs. Italian Alps have been on maximum avalanche alert today and several ski resorts closed their runs and lift systems due to the weather.Rescue operations were underway to help the trapped skiers descend to the slopes with the help of ropes from ski lifts.